His Majesty King Jigme Khesar Namgyel Wangchuck of Bhutan Attends an Inauguration Ceremony. Please click here to view a photo as well as to learn more about today’s event. Their Majesties King Jigme Khesar Namgyel Wangchuck and Queen Jetsun of Bhutan attended the “…opening ceremony of the first session of the Second Parliament…” this afternoon in Thimphu. TMs King Jigme Khesar Namgyel Wangchuck and Queen Jetsun of Bhutan Preside Over a Special Ceremony. On August 26, 2013, Their Majesties King Jigme Khesar Namgyel Wangchuck and Queen Jetsun of Bhutan presided over the “…17th Convocation of 2011 – 2013 batches of graduates of the Royal Institute of Management…” in Thimphu. For more information about today’s ceremony please click here and/or here. His Majesty King Jigme Khesar Namgyel Wangchuck of Bhutan Grants Dakyen to the Speaker of the National Assembly. On August 14, 2013, His Majesty King Jigme Khesar Namgyel Wangchuck of Bhutan “…conferred Dakyen to the newly elected Speaker of the National Assembly in the throne room of Tashichhodzong…” according to the newspaper, BBS. For more information about today’s event please click here. HM Queen Jetsun of Bhutan Launches the Jigme Khesar Environmental Research Fund. On Monday, August 5, 2013, Her Majesty Queen Jetsun of Bhutan launched the Jigme Khesar Environmental Research Fund. 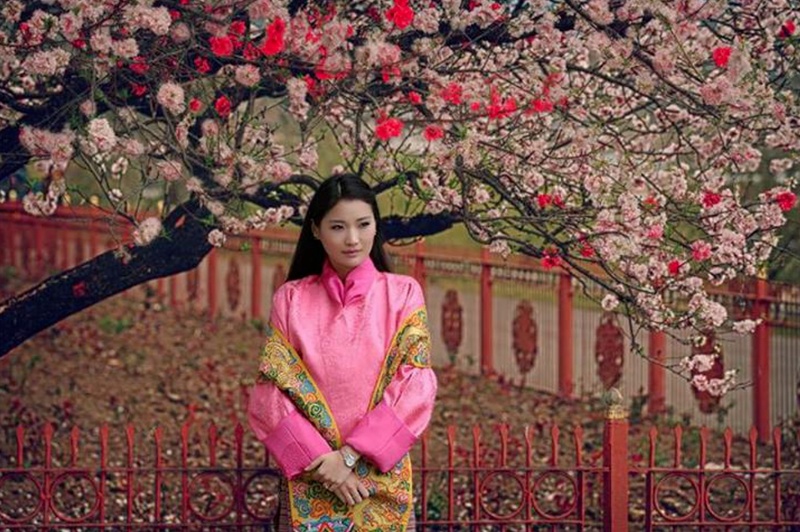 “The Jigme Khesar Environmental Research Fund, an initiative of Her Majesty as the Royal Patron of the Royal Society for Protection of Nature (RSPN), will encourage and support local environmental research in the country. After a long day touring East Yorkshire Their Royal Highnesses The Prince of Wales and The Duchess of Cornwall arrived back in London to visit Their Royal Highnesses The Duke and Duchess of Cambridge and, of course, the royal baby at St. Mary’s Hospital. On May 15, 2013, Their Majesties King Jigme Khesar Namgyel Wangchuck and Queen Jetsun of Bhutan held an audience this afternoon with the “…7th batch of DeSuung Volunteers.” And, well, that’s it. For more information about today’s meeting as well as to view a photo please click here. News Regarding His Majesty King Jigme Khesar Namgyel Wangchuck of Bhutan. On March 30, 2013, His Majesty King Jigme Khesar Namgyel Wangchuck of Bhutan “…granted Land Kidu to 3,173 thram holders in Haa Dzongkhag and Thromde, whose cases were submitted after the completion of the National Cadastral Resurvey. Please click here and here to view photos as well as to learn more about today’s event. Their Majesties King Jigme Khesar Namgyel Wangchuck and Queen Jetsun of Bhutan Attend the Paro Tsechu. Their Majesties King Jigme Khesar Namgyel Wangchuck and Queen Jetsun of Bhutan Attend the Closing Session of Parliament. On March 6, 2013, Their Majesties King Jigme Khesar Namgyel Wangchuck and Queen Jetsun of Bhutan attend the closing of the 10th Session of the First Parliament in Thimphu. For more information about today’s event as well as to view a photo please click here. And, click here to read His Majesty’s speech. On February 21, 2013, His Majesty King Jigme Khesar Namgyel Wangchuck of Bhutan “…awarded gallantry and service medals to 239 Royal Bhutan Army, Royal Bhutan Police, and Royal Body Guards personnel, Desuups and civilians” in Thimphu. Their Majesties King Jigme Khesar Namgyel Wangchuck and Queen Jetsun of Bhutan Attend a Gala Dinner in Bangladesh. On the evening of February 18, 2013, Their Majesties King Jigme Khesar Namgyel Wangchuck and Queen Jetsun of Bhutan attended a gala dinner held in their honor and hosted by the Prime Minister of Bangladesh, Ms. Sheikh Hasina. The dinner , held at the Prime Ministers residence, wrapped up the royal couple’s five-day visit to Bangladesh.